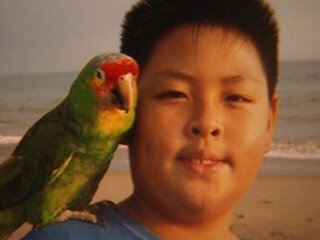 The parrot pictured to the left is the special friend of Mitchell Chareunsouk, a Sacramento-area boy with autism. The bird's name is Rainbow. Rainbow was stolen sometime last week (November 17-22, 2008). Given how portable parrots are, Rainbow may be anywhere. If you are considering purchasing a parrot, check to see if the bird you are considering matches Rainbow --would you want to buy somebody else's beloved pet? To the person who took the parrot: Please reconsider. Parrots bond very strongly with their people, and Rainbow will be miserable without Mitchell. If you were planning to sell this parrot, know that Rainbow's picture is being widely distributed. If you have purchased the bird from someone, please contact me and I will arrange to get your money back when the parrot has been positively identified as Rainbow by the Chareunsouks. Bev is organizing a reward fund -- email her for more information. I'll be adding more information and photos as I get them. Autism Vox is also on the case. MY58 news report November 24 2008 many more similar to this report. I also posted this to my blog as well. I hope it works!